DUBAI — Skyscraper construction is booming across the Middle East, with the region projected to have nearly 300 skyscrapers of at least 150 meters tall by 2015, according to a recent study titled “The Middle East: 20 Years of Building Skyscrapers” from the Council on Tall Buildings and Urban Habitat (CTBUH). 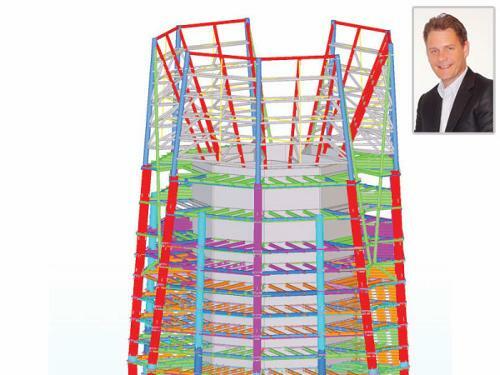 Building Information Modeling (BIM) software is driving the increasingly complex design and construction of these skyscrapers, according to an industry expert. The stunning growth of skyscrapers in the Middle East – from only two 150-meter skyscrapers in 1995, to 289 by 2015 – will be led by the UAE, which is projected to have 192 buildings (66 percent) of the total in 2015. The majority of the region’s skyscrapers will be in Dubai and Abu Dhabi, followed by Qatar, Saudi Arabia, Kuwait and Bahrain, according to the CTBUH. In order to create, manage and distribute highly-detailed and information-rich 3D models, designers are turning to BIM. The software interfaces with other solutions and manufacturing machinery, enhancing workflow and avoiding errors. BIM is also used to integrate different designs, provide analytics, generate documentation, and help identify and solve issues in the design phase before construction. Construction company Eversendai often chooses Tekla’s BIM for its projects, including skyscrapers like the Capital Market Authority (CMA) headquarters in Riyadh. At 385 meters tall, the CMA tower is the fourth-tallest building under construction in the Middle East, according to the CTBUH. Designed by HOK and Omrania & Associates, the 77-story tower is expected to open in 2014. The Burj Khalifa in Dubai, the world’s tallest tower at 828 meters, has been the most complex skyscraper to use Tekla’s BIM software. 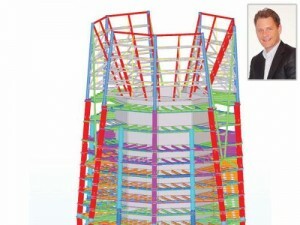 Tekla’s BIM software enabled Eversendai to model the Burj Khalifa’s structural behavior during high wind and earthquakes, redistribute the gravity load to the building’s extremities, manage the floor framing system and develop the highly-durable concrete foundation to protect against water and corrosive soil conditions. Eversendai also chose Tekla’s BIM software for the Capital Gate Tower in Abu Dhabi, the world’s most inclined tower leaning at 18 degrees; and the 230-meter Samba Financial Group headquarters in Riyadh. 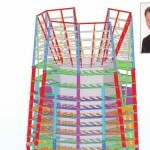 Elsewhere in the Middle East, Tekla’s BIM software has been used by steel contractors William Hare for the Aldar headquarters in Abu Dhabi, the first spherical building in the Middle East; Tiger Steel Engineering for the 380-meter Elite Tower in Dubai, the world’s 21st-tallest building and the Middle East’s sixth-tallest; and Energya Steel for the Suez Steel Company’s headquarters in Egypt.